First public demo of an LCD panel using Vivid Color technology, at the Bay Area SID Emerging Materials conference, on Nov 30th at the Sheraton Hotel, Sunnyvale CA. Left : the original (unmodified and default settings) QLED monitor. The backlight module is edge-lit with Blue LED's using Quantum Dot film. Measured output was 94.9% of DCI-P3 (by u,v area per CIE1976) using a ColorimetryResearch CR-250 NIST-traceable Spectroradiometer. All displays were set to the same brightness level, with the measurement print-outs for each provided. 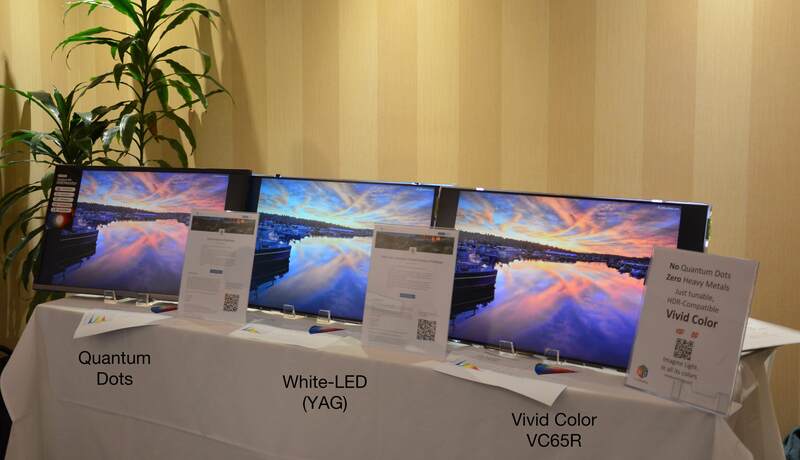 Attendees, were treated to a selection of wide-gamut images and 4K HDR videos, for side-by-side comparison. Purpose: to illustrate what can be done in edge-lit LCD panel using our entry-level VC65R product, without QD films, or KSF. As a drop-in enhancement in the backlight-bar, without mechanical changes. And what's possible for wide-color gamut and high-dynamic range inside thin edge-lit LCD backlight modules. 1. Fits inside LED backlight module, but without the issues of narrow-band phosphors (like KSF's HDR incompatible >10ms fluorescent-decay), and without flux-density limits (of KSF or QD's) reducing achievable brightness. 2. Without sensitive QD particles, heavy-metals or expensive thickness-adding encapsulated QDEF films (saving $60~100 in larger screens). 3. UltraHD* compatible rich vibrant color, in cheap prolific LCD, with as good or better than OLED color gamut, and without the OLED screen burn-in, short lifetime and high-cost issues. Application example: thin portable devices aiming to achieve the UltraHD or MobileHDR logo requirements, using prolific edge-lit LCD panels, with LED or MicroLED backlights. Or on MicroLED displays. To enhance the color gamut, and dynamic range, without increasing bezel size, introducing thicker films layers. Save cost and retrofit existing designs. Vivid Color(tm): No Quantum Dots. No QDEF films, or KSF. Zero Heavy Metals. Just bright, HDR-compatible, tunable color. © Copyright 2016~2017, PixelDisplay Inc. All rights reserved.